Held at the newly-renovated, third-floor Westgate Pool, each 90-minute Mermaid School session will include stretching poolside and instructions on tail safety, tail removal in the water, treading water in tail, breathing instructions and dolphin kick/mermaid undulation. 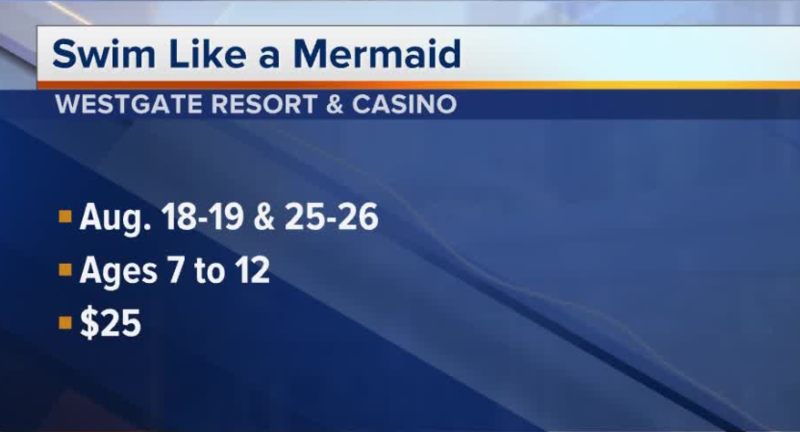 Classes will begin for Westgate hotel-casino 's Mermaid School this weekend. Instructed by Mermaid Farasha , founder of Las Vegas Mermaids, Mermaid School will be in session beginning Saturday. Held at the newly-renovated, third-floor Westgate Pool, each 90-minute Mermaid School session will include stretching poolside and instructions on tail safety, tail removal in the water, treading water in tail, breathing instructions and dolphin kick/mermaid undulation. Classes will conclude with a mermaid code of ethics discussion, including mermaid manners and kindness, and a Mermaid Meditation cool down. Mermaid School will be held Aug. 18, 19, 25 and 26. Classes are $25 per session per mermaid and will be held from 9 a.m. to 10:30 a.m.
Class openings are limited and participants must be between 7 and 12 years old, must be a skilled swimmer and must have their parents or legal guardian present. Private adult “Embrace your inner siren” classes are available upon request. Mermaid School passes can be purchased in person at Serenity Spa or by phone at 702-732-5648. Fins will be available for rental or purchase inside the Paradise Gift Shop and Cabana Shop.